No kids here at the center the first half of this week. The downside of this? My coworkers and I didn’t actually get paid for what we did today. The upside? What we did was awesome. Our bosses arranged for us, along with some of the interns from the Georgia Sea Turtle Center, to visit the Wassaw National Wildlife Refuge with some staff members from the UGA Marine Extension Service as guides. While Wassaw Island is technically open to the public, there is no causeway or ferry service to get there. 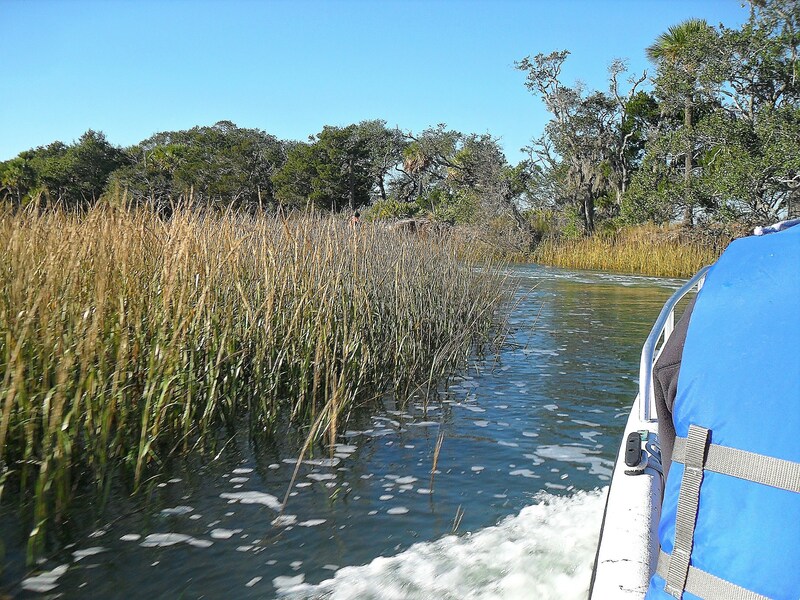 Between that and the fact that it’s never been farmed or logged, Wassaw is one of the most pristine, undisturbed barrier islands around. 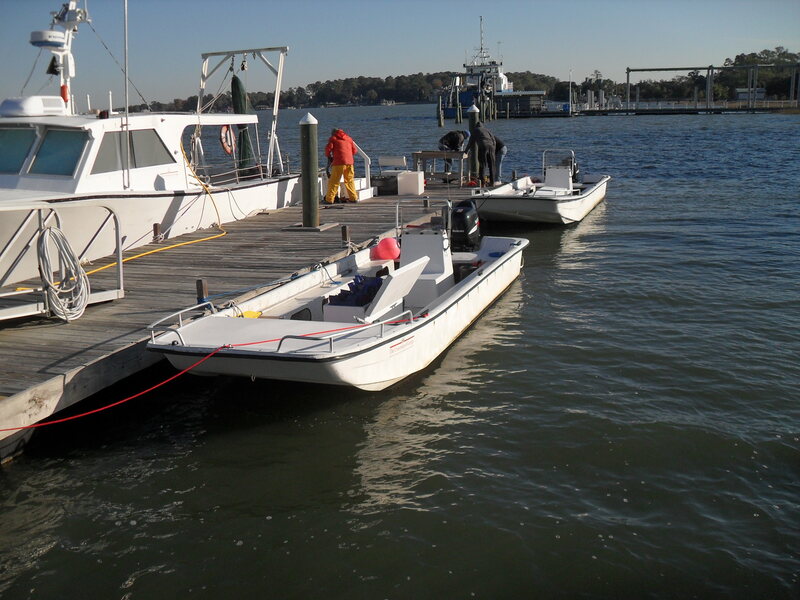 To get to the island we took skiffs, small open boats that hold ten people each. Of course, the weather picked today to turn really cold – I think as we set out for Wassaw the temperature was hovering around forty. 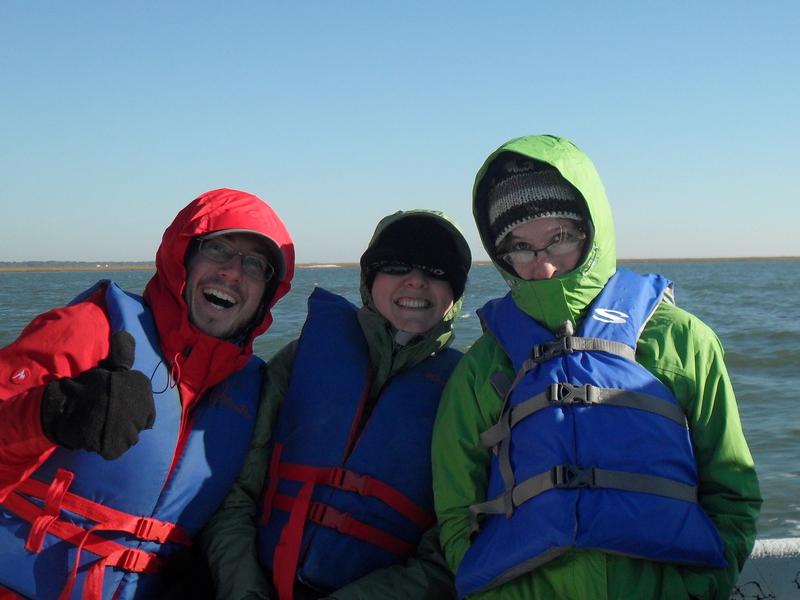 That may not sound cold to you northern folks, but when 1) you’re acclimated to south Georgia and 2) you’re out on the water in an open boat with the wind whipping around you, let me tell you, it’s frigid. When we arrived on the island our guide told us we’d probably be hiking about five miles round trip, through the woods to the beach and back. Five miles, okay, fine. But then he said something about wading through a pond. Wait, what?! Luckily we didn’t end up actually having to wade, as cold as it was. No, we walked across the potentially alligator-infested pond on the narrow, wobbly trunk of a fallen palm tree instead. The water probably wasn’t more than a foot deep, but that didn’t mean I wasn’t nervous. 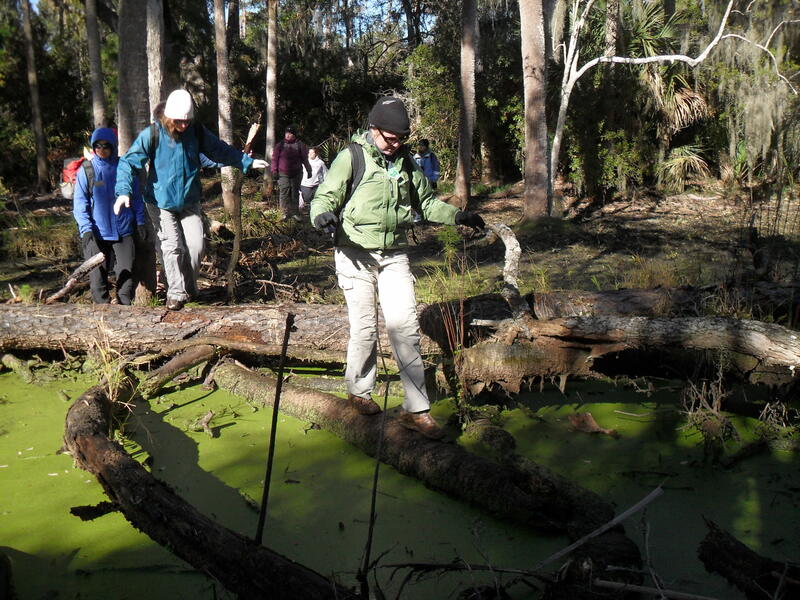 Crossing a green swamp, scaling the steep sides of dune ridges, bushwhacking through thickets of palmettos… it was all I could do not to start humming the theme music to Indiana Jones under my breath. This was turning into quite an adventure. 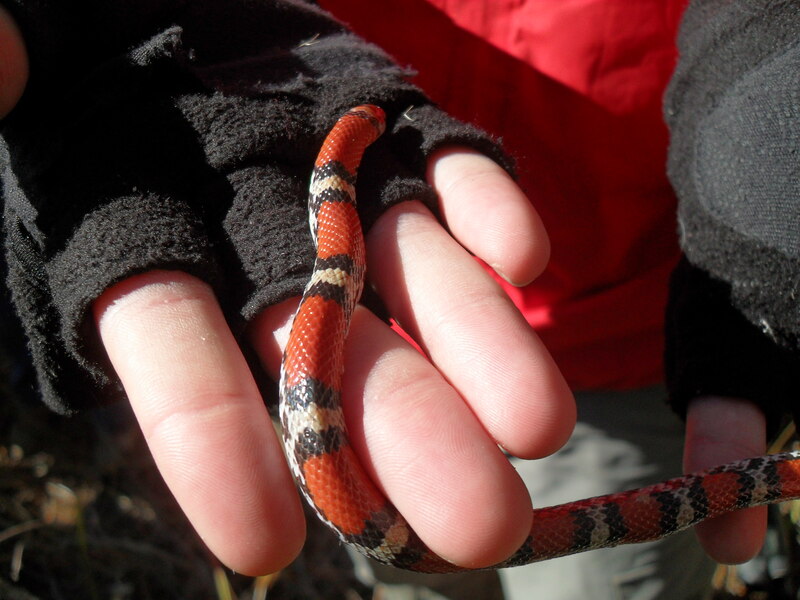 We even found a snake – a scarlet snake, a species I’d never encountered before. My photos of it aren’t that fantastic, because we had to press on rather than spending time on a photo shoot, but it’s a coral snake mimic. Remember, red on black, friend of Jack. After this, I admit, I stopped taking photographs. We made it to the beach alive (whew!) and enjoyed being the only ones there, watching the antics of the plovers and dolphins and picking up as many sand dollars as we could carry. The best moment of the day, however, came on the return boat trip. We stopped to get a better look at a Bald Eagle soaring overhead, and someone said, “Hey, dolphins.” I turned around and saw a pair of bottlenose dolphins watching me from the surface of the water, no more than two or three feet away, close enough to reach out and touch. Eagle overhead, dolphins around us, the wind in our faces… I can think of worse ways to spend a Monday afternoon. My job may sometimes be a bit stressful, and living in Georgia may occasionally make a Yankee like me feel like a fish out of water, but you know what? Overall I have no complaints. I knew about Sierra Kingsnakes but had never seen a Scarlet Snake. Beautiful and delicate. I’m jealous of your snake sighting! It’s a cute little guy/gal! I definitely agree that 40° on the water is crazy cold! I’m surprised you found a reptile of any kind. Fantastic trip! Sounds like you had a great day! I agree with Anne – surprised you found a snake on a cold day, but then it was probably out in the sun. Gorgeous snake! I can’t imagine being so close to a dolphin in the wild – must have been a thrill. Topped off with a soaring Eagle…sure enjoyed your post.